I love being in my kitchen. I'd happily spend all day trying out new recipes and honing my culinary skills and knowledge. Being in my kitchen is soothing and inspiring for me, and one of my favorite creative outlets. However, there are days that are long and time or energy is not on my side. There are days/weeks that grocery store runs have been minimal or we're at the end of a pay period and waiting to make the big grocery trip. There are days with evening plans and dinner has to be quick. Every day, we don't have a dishwasher, and sometimes I just really don't want to stand at the sink anymore. There are days when dinner just really needs to be quick and simple. Quick and simple doesn't have to mean lunchmeat or peanut butter and jelly; however, sometimes a good pb&j is the perfect dinner to consume. Childhood revisited. Quick and simple can still have a little flare or elegance to it, or quick and simple can be just the comfort meal you need that day. And I think it's a bit in the way you approach the meal, too! Gratitude, joy, and creativity are required elements in the kitchen, my friends, whether you're laboring over a 4 course dinner, waiting for the timer on a frozen feast, or sandwiching together grilled cheese. Speaking of grilled cheese......it's first on my list. -- saute onions and mushrooms and add them to your sandwich. -- make a "caprese" grilled cheese using fresh mozzarella, tomatoes, and basil (substitute spinach or arugula if you don't like a strong basil flavor). -- add avocado, bacon, tomato, ham or turkey, spinach or arugula, cranberries. -- instead of grilled cheese, make it a grilled mac and cheese. AHH! -- or a grilled pimento cheese. 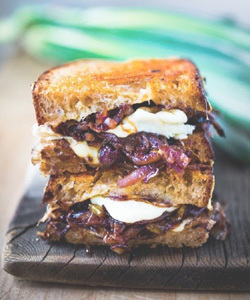 -- make a brie & apple or gouda & apple grilled cheese. perhaps add some bacon. There's a part of my heart carved out just for pasta. Pasta and bread, all the day long. -- make our new favorite: this simple, light homemade marinara sauce. add meatballs if you'd like. -- a baked ziti that you can easily prepare earlier in the day or a day previous and bake that evening, and it's kid friendly. Cook your penne and mix it with marinara sauce or a marinara/alfredo combo and top with mozzarella and parmesan cheese. -- make spaghetti carbonara or a bolognese sauce. -- make pasta e fagioli. it's truly Italian comfort food. my lovely friend, Lauren, makes the best. -- shrimp scampi. it's light, fresh, and simple. -- a favorite way to prepare some bread to go alongside. take a baguette and cut into serving slices, just DON'T cut all the way through, so the loaf is still connected at the bottom. slice slivers of butter and place into each crevice and then sprinkle garlic salt all across the top/crevices of the bread. Then sprinkle mozzarella cheese all over the top. Wrap the bread in foil and place in a 350 degree oven for 15 minutes. Pull back the top of the foil so the bread is exposed and cook for 5 more minutes so the cheese gets nice and golden brown on top. we devour this bread. a good salad makes for a great dinner, especially in spring & summer months. sometimes "light" is just what you need. -- greens, veggies, chickpeas, cranberries or dried cherries, grapes, avocado, olives, nuts, cheese, meat (leftover chicken, salmon, tuna, lunchmeat). it's quite simple to create your own salad and homemade salad dressings are delightfully simple as well. and a good salad in spring/summer is perfection. -- chicken caesar salad. roast chicken breasts earlier in the day and later shred them/slice them/cube them up and mix with romaine lettuce, croutons, parmesan. one of my favs. -- egg salad or chicken salad. Little bits and pieces to wrap it all up. -- make a simple homemade bread or buy a nice artisan loaf from the grocery, cut it up and serve alongside a cutting board topped with different cheeses, meats, olives, pickles, pepperoncini or banana peppers, apples, grapes, or oranges. It makes you feel fancy and it's so easy. -- grilled tilapia in foil. wrap tilapia fillets in little foil packets and before sealing sprinkle them with salt, pepper, and squeezes of lemon juice, then set them on your grill or grill pan over medium heat. it falls apart and it tastes so good. -- homemade mac n' cheese. try one made with greek yogurt! -- quesadillas -- easy to fancy up or dress down and always good dipped in homemade salsa. -- baked potatoes or sweet potatoes. -- in the spring & summer some of the best sides are roasted or grilled veggies and/or fresh fruit. And, my friends, there is never any shame in frozen pizza, boxed mac n' cheese, frozen chicken tenders. It just makes the day easier sometimes. Plus, the frozen food game has been greatly upped in the last little while. We always have purchases from Trader Joes frozen aisle in our freezer and I'm always thankful we do. Embrace creativity, friends, and don't find your value in how many culinary marvels you can whip up every week for you and your family. Frozen pizza and a side salad can be the best meal ever when it's accompanied by good conversation, laughter, and a table full of cherished faces. Happy Cooking, lovelies! And please share any simple recipes you have, as well.